The 3.7.3 update is targeted at existing users of Equipd. 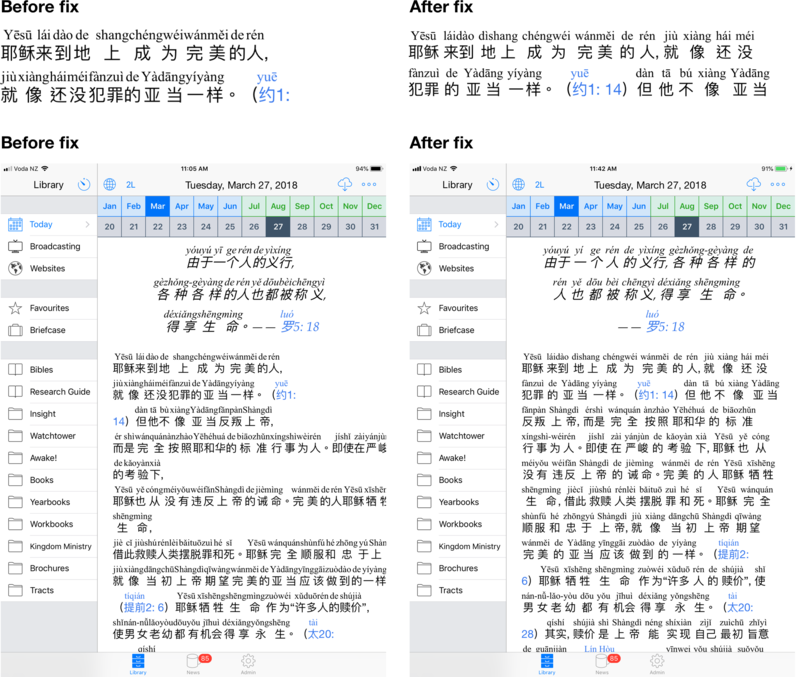 It is an emergency update that fixes issue with spacing between words in Pinyin, Zhuyin (Bopomofo) and Sidney Lau. This issue affects all Chinese language content downloaded and cached after 23 March 2018. The code used to insert breaks between words in the Chinese characters was changed in the HTML which meant that individual words could not be identified, were thus incorrectly translated, and scripture links were broken. Any issues with this update please email support@equipd.me. As before, in order to push out this update to existing users of Equipd I will need to make the app available on the App Store for a short period of time. It is essential that users upgrade promptly before the app is removed once again from the App Store. You will not be able to update to version 3.7.3 once I have removed the app again. This is to work around limitations with the App Store where it is not possible to update users who already have an app without the app being generally available. However users should remind themselves of the initial announcement about the app being removed as the overall status has not changed. And please ensure you take a backup of this latest version (3.7.3) of Equipd, just in case you need to restore the app on your devices in the future.